A brand new addition to our range of Lysistrata resources for Edexcel's Component 3, Section C. This product will stretch your most able Drama and Theatre Studies students. 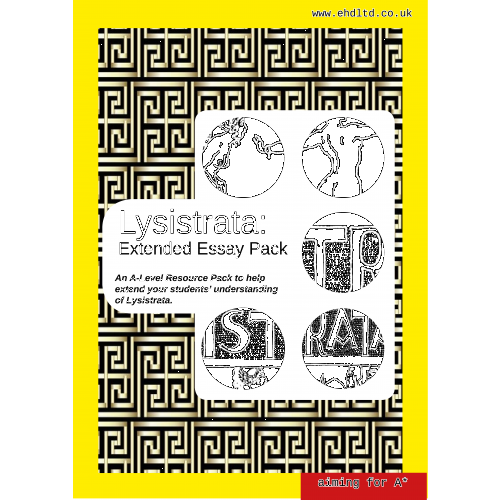 It is a photocopiable collection of critical essays about Lysistrata. Teachers often tell us that they struggle to find resources specifically for the most able students and this product solves this problem. This is an A4, photocopiable booklet of critical essays. You could perhaps use the essays at regular intervals throughout the year for reading homework, to ensure that your students gain sophisticated and perceptive interpretations when creating their own performance concept for the play, or hold university-style lectures using the essays as your starting point. Each essay tackles themes, issues, style and critical interpretations of the play and encourages students to analyse the play from a directorial perspective and consider how they might present key aspects of the play to a twenty first century audience. All essays include key quotations from the play, alternative interpretations for consideration and each essay is followed by a breakdown of key directorial considerations to serve as revision of key areas for students. The essays will prompt students to develop their own interpretations of the play further, encouraging them to consider debates surrounding the play, political thinking in relation to the text, make creative decisions, consider the use of dramatic elements and will challenge students to consider perspectives they may not have already done so. The essays will stretch your students and encourage them to reach their artistic potential with this text. - Approaching Lysistrata from a feminist perspective. - Conveying Lysistrata's leadership qualities in performance. - Interpreting Aristophanes' representations of women. - Directing Aristophanes' male characters. - Directorial approaches when staging a classical play in the twenty first century. - Approaching the political messages of the play. - Analysing the conventions of Old Comedy and directing the comedy of the play. - Exploring the potential for satire in performance. - Depicting Lysistrata's fight: whether to convey it as powerful or futile. - Taking inspiration from other practitioners when forming a production concept. - Ways in which the feminist messages of the play can hold relevance for audiences today. - Possible interpretations of the female characters (including 'lipstick feminists', 'ladettes' and peacekeepers). - Presenting the contrasting characters in performance, focusing upon the use of stock characters and caricatures.